February 15, 2011, 12:50 p.m. Kinda. Just, not to Glendale, Arizona. It's a shared facility, remember, Dodgers and White Sox, so you've got twice as much to choose from. If you count Chicago's Juan Pierre and Lastings Milledge. The Dodgers begin Spring Training with a gaping hole in left field. Think Sunday morning softball, you're one short because your regular was out late partying the night before, and in his stead are two guys fanned out across the outfield. The most talked about scenario – a Jay Gibbons, Marcus Thames platoon – is the least likely to happen. We hope. The spin is, they're both experienced major league hitters, and a combined line of .275, with 25 homers and 80 RBIs is possible. The thing is; it's not. Gibbons and Thames would make fine pinch hitters, but who carries two pinch hitters? Not teams trying to win a pennant. Both men, and this is as nice a way to put it as is possible, are defensively challenged. Despite the common wisdom, Manny Ramirez at 37 was a considerably better left fielder than either Gibbons or Thames, both 34 the first week of March, can dream of being now. In fact, Gibbons would be lucky to make it to June without injuring himself shagging. Besides, the notion of the man producing in a full-time role at this point in his career is just plain folly. Tony Gwynn, Jr. is a nice little player, sure. A superior player to his uncle, T-Junior is an excellent outfielder and a threat to steal a base off the bench, but not a major league regular. Better he has a nice spring with the bat than not, but it's not going to be particularly meaningful either way. Xavier Paul, on the other hand, has a chance (a chance, mind you) to become a solid big league player. And barring a real or imagined injury toward the end of the Cactus League schedule, since he's out of options, this is his last chance in Los Angeles. The Dodgers don't really know about Paul's capabilities, but while he's the least talked about candidate today, he's going to get as good a look as anyone. And I'm rooting for him. He's simply got to stay healthy starting now. If he does, I think a .275, 10 and 60 line is possible. With good defense, some degree of clutch hitting and the ability to hit second, the Dodgers just might take that. Since there are typically three or four right-handed starting pitchers for every lefty, with Paul getting most of the starts, a platoon with Thames wouldn't be the end of the world. To start the season, anyway. While no one has said a thing about this publicly, who knows, Jamie Hoffmann might get a real opportunity this spring. His defense is major league-caliber, and perhaps facing primarily left-handers, in a platoon with Paul, it just might work. Stranger things have happened. Of course, a pre or early-season trade is always lurking, and you might as well prepare yourself for Cleveland's Grady Sizemore right now. Injuries have sidetracked his career the last two years, but you could have said the same thing about Jayson Werth in 2008. And Sizemore has accomplished a whole lot more than Werth ever did before breaking out with Philadelphia three years ago. Don't worry about the medical rap sheet. This is not J.D. Drew we're talking here, but a man who makes 750 plate appearances per year. 750. If Sizemore's sufficiently injured, the Dodgers won't trade for him. But if he's healthy, or about to be, and even as another left-handed bat, he'd be a perfect fit for the club. A natural center fielder, Sizemore hits for average, power, gets on base and knows what to do literally everywhere on the diamond. A trade like this will cost prospects – coveted prospects – but Sizemore is a player worth that cost. Very much so. None of this maybe-at-the-break BS will suffice. You want an impact player of this caliber, at $7.5 million this year and $8.5 million next, you make it happen in March. Speaking of Animals: I swear, if one more girly dog cons Westminster into another Best in Show, I'm going to start a popular revolution. Facebook, Twitter, the overthrow of despotic judges and the whole nine yards. I'm sorry, but a poodle – any kind of poodle – just cannot be Best in Show, nor anything else. Neither can a Lapso Facto or Dipsy Doodle. Enough, already. 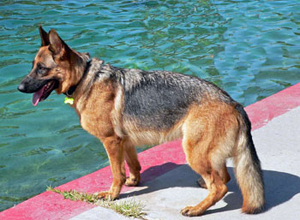 The German Shepherd Dog does not lead the blind for nothing, people. Hello?! A GSD should win every year, paws down. Here's our beloved Abby Scott Cole, guarding children at a local pool. Klubhouse Klepto: With Gibbons and Thames threatening to make the team, what the Dodgers need now is Ruben Rivera to make sure neither can run out to his position fully equipped. Bring me the glove of Jay Gibbons, I say! Bring me the glove of Jay Gibbons! !